Home Vape Tutorials Beginners You Gotta Chill: Is Refrigerating E-Juice a Waste of Time? 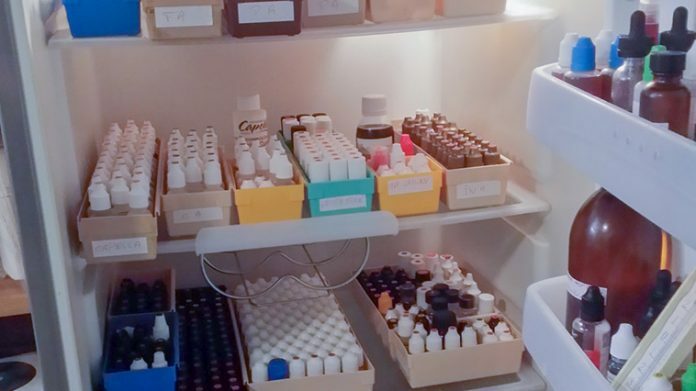 You Gotta Chill: Is Refrigerating E-Juice a Waste of Time? Refrigerating e-juice. What does it actually accomplish? And should you even spend time doing it at all? I have overheard vapers talk about the benefits of freezing/refrigerating e-juice before, but was never able to get a straight explanation for the reasoning behind the liquid cooling. So I decided to test the theory out myself. I used the same flavor ejuice for all my testing: Orangeade by Lemonade Stand. I choose this ejuice because it’s extremely clean, and very one dimensional (not a whole lot going on, just pure orange flavor). I figured the less complex the liquid, the better chance I would have of noticing any differences. Phase 1. Cooling for one hour. Phase 2. Cooling for 5 hours. Phase 3. Cooling liquid 12 hours/overnight. Base. Bottle of e-juice kept at room temp for 12 hours. TESTING NOTES: For my testing, I used a mini fridge kept at 40-42deg F, a 0mg 30ml bottle of 80/20 (vg/pg) e-juice in a glass dropper style bottle, and room temperature of 68deg F. For my setup: a single alien clapton (.18ohms), vaped on a dual 18650 unregulated box mod. I varied cooling intervals, but the refrigerator temperature stayed consistent throughout testing. 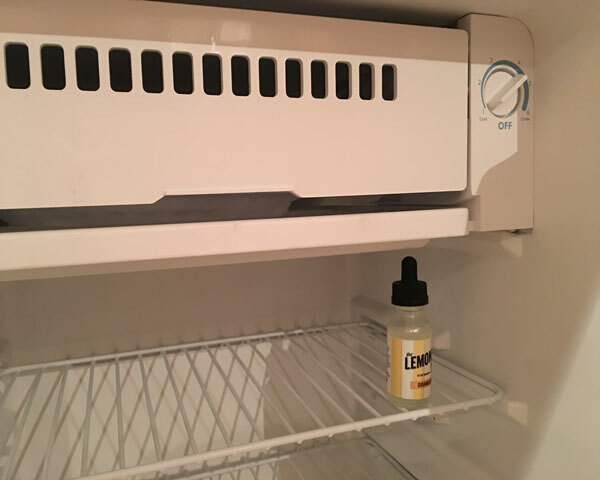 The bottle of cooled e-juice was used immediately after removing from the mini-fridge, but a small increase in temp (from my hands mostly) should be taken into consideration for contact with body/hands (+5-10deg F). Consistency: I was surprised at how much the consistency of this liquid changed with only an hour of cooling time. The 80/20 blend, had a thickness similar to that of a Max VG dripping liquid. Flavor: All fruity characteristics of Orangeade stayed exactly the same. Aftertaste was clean. Mouthfeel: No noticeable difference in mouthfeel at all. Consistency: With five solid hours in the refrigerator at 40deg F, the liquid had the viscosity of the 100% VG mix. Flavor: No noticeable difference in flavor. All fresh orange notes came through on the palate in exactly the same manner. Aftertaste was just as clean as liquid vaped at room temperature. Mouthfeel: No noticeable difference in mouthfeel. Consistency: My bottle of Orangeade was as thick as honey at this point. I did note a slight change in the appearance of the e-juice (more bubbles etc. maybe some sugar crystallization…). The thickness made it difficult to drip accurately (this was mostly due to the fact that so much of the liquid would stick to the dropper…). Flavor: Exactly the same as the room temperature e-juice. No notable differences in flavor or aftertaste to note. Mouthfeel: No changes in mouthfeel were noted. Consistency: Perfect 80/20 blend, perfect for dripping. Flavor: Really well-rounded orange flavors. Bright notes of Naval Orange and hints of Clementine. Very low sugar content, and a clean aftertaste. Mouthfeel: Because Orangeade is such a simple, low sugar liquid, the mouthfeel remains very smooth throughout the vaping experience. Throughout the three phases test, the only noted variation as a result of cooling the liquid was viscosity. Flavor and mouthfeel stayed exactly the same in all during all three phases. So if you’re looking to thicken your e-juice temporarily, then refrigeration may be for you. Otherwise, I wouldn’t waste your cooling bottles of vape juice overnight.